I know its been posted before but I’m posting it again. 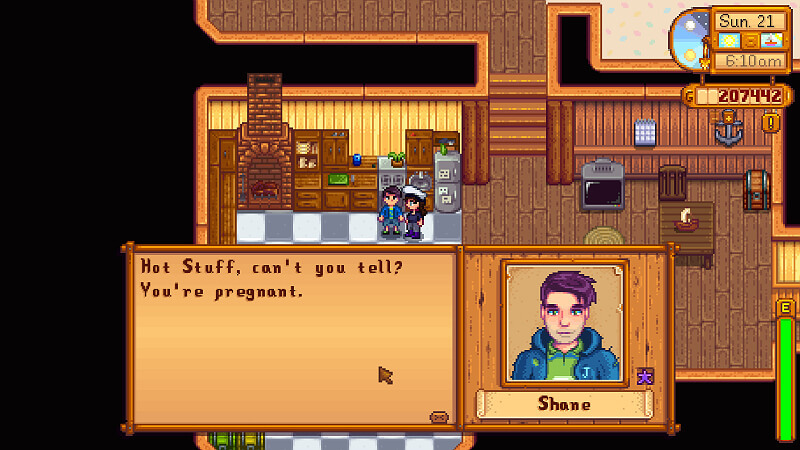 You know exactly what I mean when I say that the children need an update, not to mention the pregnancy mechanic. It’s exiting to get married and start a family but your wife never “shows” and prepares for the baby, the children never grow up and no one aknowleges that the children exist. While I think the dialogue could be easily added, The real downer is the children themselves. I have seen many posts about this issue and while some of their points against this are valid I feel like there is a way to have them grow without many drastic changes in the NPCs. There was one idea that I liked and that was to have the town change with the children in stages. Here are my thoughts and ideas on what raising children could be. This is my fantasy/idealistic version of the children update. They can take one of 8 life paths once they grow up: The Farm Path, The Education Path, The Arts Path, The Music Path, The City Path, The Athletic Path, The Delinquent Path, and the Freeloader Path. The gift you give your child on his birthday modifies his path. Depending on how you raise them and what gifts you give them they will choose one of these paths. Once they pass the child stage (Age 7) their path is set. 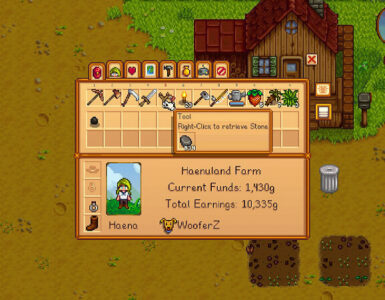 The Farm Path: Gift Seeds (2x with Shane)- Grows up and works on the player’s farm and eventually inherits it. He/She tends to animals and cares for planted crops. The Art Path: Gift a Painting Set (2x with Leah & Elliot/1.5x Emily) Grows up to become a Painter, Chef, Actor or Dancer. They send a medium check monthly. The Music Path: Gift a set of Drums (2x with Sam & Abigail/1.5x Elliot) Grows up to become a Musician, Dj, Singer or Songwriter. They send a medium check monthly. The Athletic Path: Gift a Gridball (2x Alex/1.5 Sam)- Grows up to become a Gridball Player, Coach, Masseuse or Personal Trainer. They send a medium check monthly. If He becomes a Gridball Player (a rare chance) he will send a very large check monthly. The Delinquent Path: Spoil them and don’t discipline them. Runs away from home as a teenager to rob, steal and eventually go to jail. When they go to jail they decrease the spouse’s hearts by two. The player can have another child if one of their two children becomes a delinquent, but only once. The Freeloader Path: Spoil them- They will live in your house but won’t help in any way. They will eventually leave after they are married or change their life path on their own. While all of the paths seem straitforward, the idividual careers are at random except the gridball player in the athlete path. Each of the 8 paths aren’t equally easy. The Education path is the most difficult to pull off and requires the most discipline. The delinquent and freeloader paths are the easiest. If your child takes the athletic path they have a greater chance to go pro if they have allot of discipline. The Wizard – If you want to see your child’s current life path you can speak to the wizard to find out (6 hearts). Aging – I named this the Idealistic version for obvious reasons. On many of the forums I read, people said the sprite changes and deceased NPCs would be too much work if the children reached adulthood but I can dream can’t I? 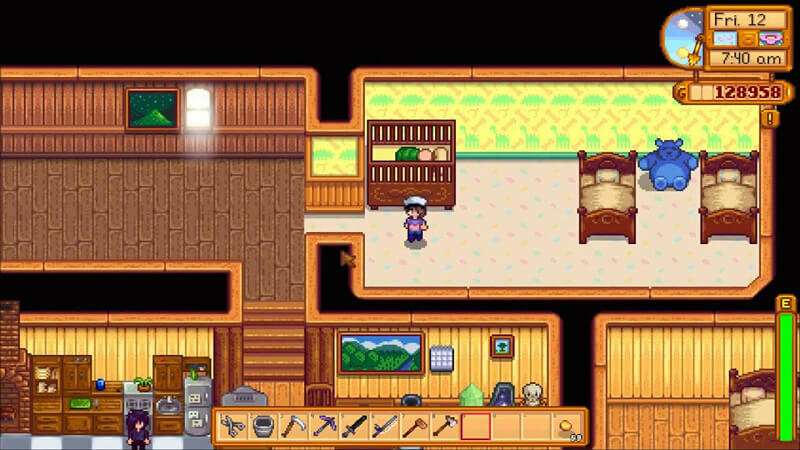 This is my realistic version of the children update. They would have Vincent and Jas grow up to become teenagers (UNMARRIABLE) once the player’s first baby becomes a 7 year old and leave the rest of the NPCs alone. The adults shouldn’t look drastically different after a few years. The boy tends to the crops and forages available resources (including artisan crafted ingredients). The girl befriends the animals, caring for them each day. She also collects their resources and lets them outside in the morning unless it is raining. Once their chores are done they will leave with their mother/father at 10:00 AM to go to town. Later they go to the park to let them play. If any events occur, they will be with their mother when you arrive. 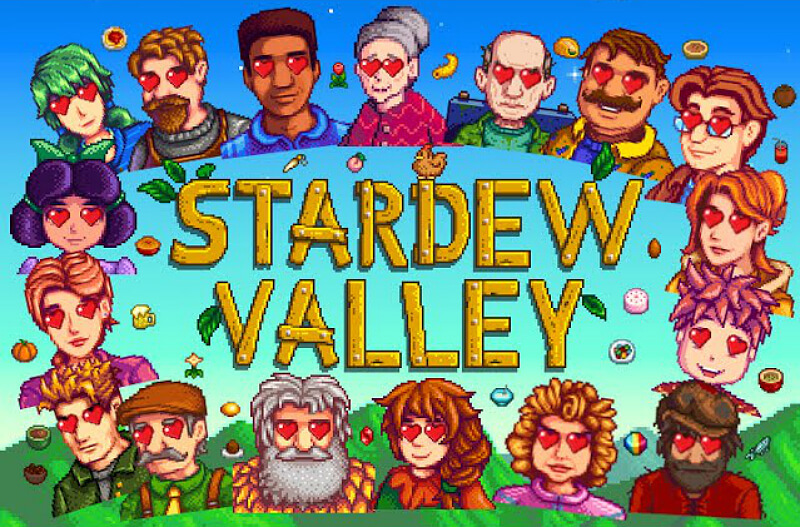 Unfortunately, in this version the children never get older than Vincent and Jas but at least now they will be able to speak and help out around the farm. It’s better than nothing. Whether the children’s mechanics are updated or not, pregnancy should still be more meaningful. I came across this youtube video that shows the preview of a pregnancy mod but I don’t think It ever came out. This video is a perfect example of what pregnancy could be in my opinion. It’s really neat so please go watch it. While I was diging through forums I saw quite a few people saying that they would buy this update if it was in the form of a paid DLC. Honestly I wouldn’t think twice about buying a hearthstone style DLC and I know I’m not the only one. Maybe even increase the price of the game if he need to. This way he gets paid for all of his hard work. I would impliment it as an optional feature when players create a character. 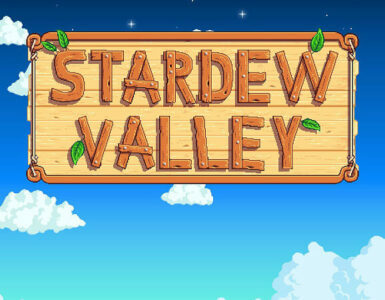 On the character creation screen there would be a box for Stardew (Original) or Stardew Legacy where your child inherits the farm and can marry the remaining bachelor’s children. The Generation DLC would start 7 after years pass once your second child is born. Time would skip until the child becomes 20 and the their parents would leave to travel the world together. The older sibling becomes the new governor. Depending on how your first character played the game the town and NPCs would change. For example, if the player finished the community center the town would have more people and shops. 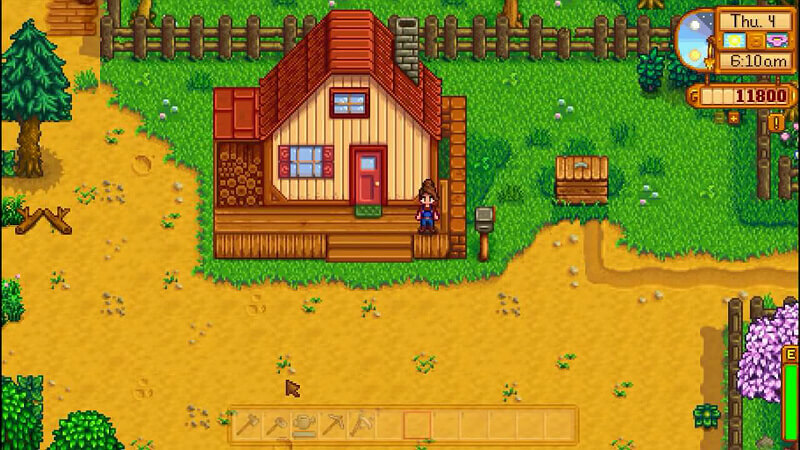 If the player buys the Joja membership, the town would expand but Pierre’s would run out of business. The only difference in the pre DLC content is that you can choose the gender of the second child. The next player being the youngest child. There are three main objectives in this DLC. 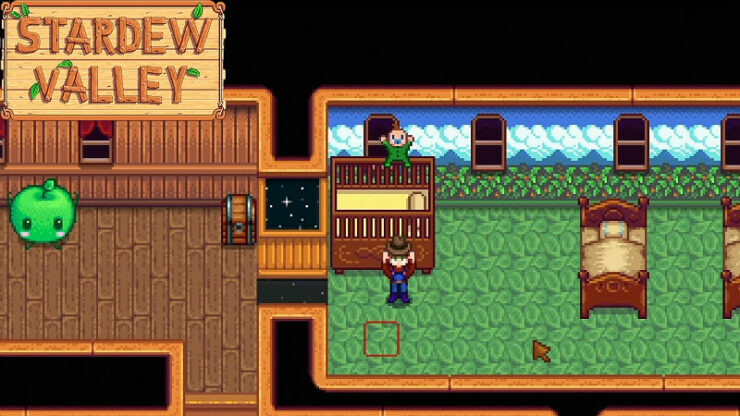 Get the town out of debt, Stop Joja from dumping waste in the valley and start a family of your own. Copper Watering Can: How is This an improvement?